Pino’s Last Call has been a Walworth dining option for more than 30 years. I’ve eaten their pizza many times, and count it among the best tavern style pizza in the area. In spite of these years and because of this pizza, I’ve never, ever, eaten anything else from Pino’s. It’s a pizza place, so I order the pizza. Except last Friday night when I went to order the fish. Every restaurant in Wisconsin is a fish restaurant on Friday night, so whether Pino’s wants to or not, they submit to the expectation. Friday night I found myself in the restaurant, hungry. Pino’s occupies the old Ben Franklin store in Walworth, tucked into the back of a small strip-mall style enclave wedged between the old town square and Sentry. The space is large. Correction, the space is too large. It’s a space that I’m sure fills at certain times, but most of the time it’s just a large restaurant that feels rather sparse. My wife and I entered around 6:30 pm and made our way to the North side of the restaurant, opposite the bar area, and sat down in what was the frame department of my youth. The high top for two was fine. The waitress was cheery and table side in a reasonable amount of time. I had asked to be seated in the bar area on account of the NCAA basketball that occupied those televisions. I am nothing if not an inattentive dinner date. I asked if any appetizers were worth ordering. She said the mozzarella sticks are homemade, rather than saying they were housemade, which is, of course, the correct way of identifying the location of assembly. 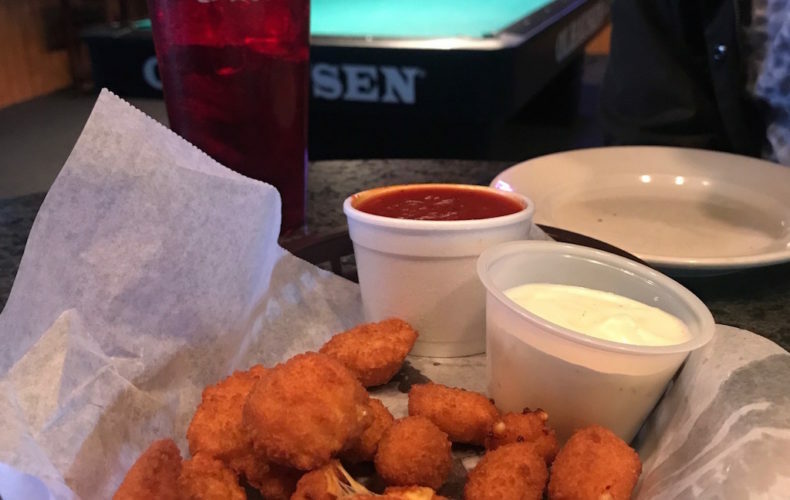 I ordered the cheese curds, because my wife is a curd aficionado and we’ve had a nice run with the curd lately. The fish fry is Haddock, a Cod like fish that’s somehow different. A quick google search told me that Haddock is drier than Cod, a bit more firm, and nearly indistinguishable from its dark water dwelling relative. The Haddock is served broiled or fried, all you can eat, with potato pancakes or fries. I ordered the usual, one piece of each, with the potato pancake. The cheese curds were brought, along with our waters. Michigan State was winning. The curds were fine. Not the best I’ve ever had, but fine. Sort of similar to a Culver’s curd with a breading and not a batter. They are served with marinara sauce rather than ranch dressing, and while I prefer the ranch I did like their super sweet marinara sauce very much. The wait for our fish was somewhat lengthy, but not so long that it felt like an inconvenience. I watched some of the game and some of the kids pestering their parents for video game money (there’s a small arcade area near the front door). When the fish made its initial appearance it was obvious were weren’t dealing with Cod here. The Haddock was in small fish-stick shaped pieces, two pieces fried and two pieces broiled. The pieces were small, perhaps four or five bites each. The battered was golden brown, the broiled sprinkled with a top spicing of paprika and what I thought to be oregano. The broiled was a bit dry, which is apparently a hallmark of Haddock. It was passable, but I didn’t find it to be magical in any way. The fried was a bit soggy on the exterior, lacking any particular crunch. When cutting off a bite sized section with my fork the fish fell out of the battered exterior, leaving me with some hunks of fish and a calamari shaped ring of batter. This wasn’t ideal. The fish had a nice flavor, perhaps preferable to a typical cod dinner, but I didn’t care for the more dry texture and I didn’t like the deconstructed arrangement between the batter and the fish. The potato pancakes came two to an order, which was a welcome plurality after the singular cake at Crafted Americana. These pancakes were not crispy, a bit greasy, and a touch dry. This is not a winning combination for a potato pancake. After having found several pancakes with interesting flavor profiles, this was back to the single note, rather bland cake. It falls somewhere in between the average pancake on this tour and the poor pancakes I was served at 290 and Gordy’s. As I ate, I longed for the delicious pancake of the Lookout Bar, or the Big Foot Inn. The sides of applesauce, tartar sauce and coleslaw were served in small plastic containers. The applesauce was perhaps two large spoonfuls worth. It was smooth and bland, but at least it wasn’t hot. The coleslaw and tartar sauce were okay, my wife said. I noted the lack of enthusiasm in her eyes. In spite of our orders being identical, my wife’s dinner was served with a small container of drawn butter, but no applesauce. I was served applesauce but not butter. This is an inconsistency that shouldn’t be tolerated, at least not by a restaurant that’s been in business for thirty or more years. There was no bread for the table, no butter, softened, foiled, or otherwise. I have no relationship with Pino’s. No fond memories of eating here with family and friends, laughing the night away. Because of this I can judge this dinner without any cloudy encumbrances of nostalgia or familiarity. This fish fry was not memorable. It was cheap, and at $9.95 per for all you can eat it registers as our most economical dinner of 2018. But the fish fry was mediocre at best. There were too many misses to consider this a fish fry worthy of your time. In spite of this, I still think you should visit Pino’s on a Friday night. Just order the pizza.